In ancient times before the internet, cell phones, and Amazon, my husband and I took our first trip out of the U.S.A. How did that happen? My little secret was: I filled out all the information postcards from various travel magazines for foreign trips and cruises, then signed as my spouse. Steve started getting all these travel brochures, and thought our travel agent was responsible! Hee, Hee! The result was really interesting. We started looking at all the travel places and options, and made our move. We booked our first cruise and got passports. Ta-Da! The year was 1995; our cruise was Athens to Barcelona on the Queen Odessey. Feeling like a two-week old baby rabbit, I brought two huge suitcases full of clothes. That is pretty standard for the ships with formal and semi-formal evenings. The flight from Phoenix to Athens scared me to death. I had not been on a long haul flight before, and the whole idea of being in the air for so long put fear and confusion into my brain. After several cocktails, I relaxed and enjoyed the trip. We arrived in Athens on an extremely hot day. I remember getting off the airplane on the tarmac watching the heat waves rise around me. The airport was very old, and crumbling as we walked past the submachine gun armed military guards both outside and in side the terminal. I was wondering just how safe was this place? We got our bags, and one of my brand new bags was ripped open exposing, of all things, some of my underware! In our hotel room, I inspected the damage and nothing was missing. Steve went in search of repair tape, and returned with a roll of duct tape. (We always travel with duct tape, because it has so many uses in an emergency.) That mended the rip for a while, but I remained unhappy with little satisfaction. We had a wonderful first time experience in Athens. We saw a local dance and music show, the Acropolis, the Plaka shops and restaurants, and ate wonderful food. We fell in love with Greece. At the Acropolis, I was narrating a story about the statues and architecture from my art history education to a few of the travelers from the ship in our group. The official Greek tour guide caught me talking and told me to “Shut Up!” in perfect English! I didn’t, and continued on at the back of the group out of ear- shot. The cruise was wonderful. Since this was my first trip out of the country, I packed my camera and lots of film, but I had a lot of photography experience….. Photography has always been a part of my life, as it was introduced to me as a child in Sedalia, Missouri, through my father’s avid amateur interest. As a child, he made himself a simple box camera and later bought an Argus 35mm camera, with a 50mm lense. He took photos of everything, but mostly of his family. We patiently posed for him so he could get the picture just right. I can’t tell you how many times my eyes cried looking into the sun and smiling for Dad. When I got older, I received my first camera, a Kodak Brownie, for my tenth birthday. Under my father’s guidance, he taught me the fundamentals of photography and the importance of observation. He had his own darkroom in a utility room just off our kitchen. Because he shot mostly black and white Tri-X, he could take a roll during the day and develop the negative strip in the evening. He’d usually have a dry negative strip or two ready to be printed. I watched him every time he went to his dark room. I’d stand very still on a stool next to him watching the whole process. I loved the red light! I had a hard time understanding the magic of the photo that amazingly appeared on a white piece of paper. He printed photo after photo. I was in charge passing him the correct piece of trimmed paper for each photo from the black envelope. Afterwards, I placed the wet photos on the clean chrome sheet face down and squeeging the water out. The metal sheet was hooked into a photo drier until they were fully ‘cooked!’ The best part was getting to see the finished product. We looked at them first and then proudly showed them to the rest of the family. This was a weekly ritual for years. Lense On! ™ is a photography platform bag to stabilize a camera and lens whether one is in a safari truck or a sports photographer; wherever there is extremely limited working space requiring a fast set up and take down. I never had my own 35mm for many more years, but I had the use of Dad’s old Argus and used it throughout high school and college. I was an art student and photography was a way to capture a single moment without having to spend hours in the same place sketching or painting. Gathering reference work was my primary reason to use the camera. I did manage to squeeze in a regular photography class in college. That enabled me to fully realize the mechanics of photography and how it works. I was off taking photos of things I never had thought about before; I was creating stories with the photos. I did discover that some photos were good by themselves, but do not make a very good paintings. Conversely, some photos that were mundane would make very good paintings. At this point, I was taking photos for two reasons. 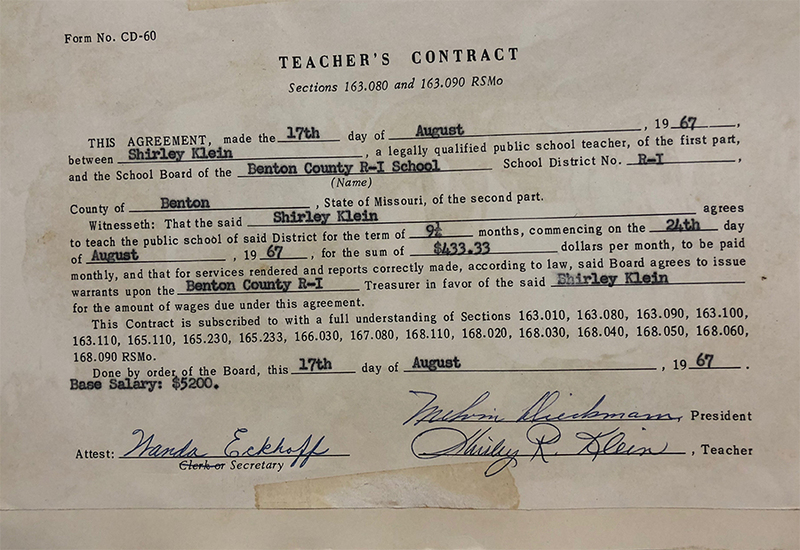 After graduating from Central Missouri State University, Warrensburg, Missouri, I accepted a teaching position in Cole Camp, Missouri R#1 Unified School as their art teacher grades K-12. When the superintendent found out that I had photography and yearbook training, he asked me to be the sponsor. It was an extra $200.00 a year, bringing my salary to whopping $5,200!! That was a real OJT experience for me. 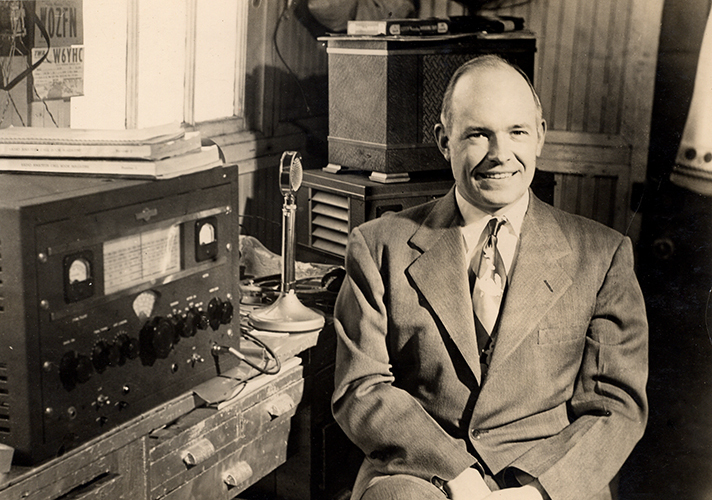 I had a small three-room apartment above a business on the main corner in ‘downtown’ Cole Camp, Missouri. There was a small storage room between my bedroom and the hallway where my bathroom was. It was there I set up my darkroom. Dad had long since given up his darkroom, so I asked to use his old stuff. The enlarger was an old Argus camera mounted on an aluminum vertical slide with a light housing. The black composition photo pans were chipped and old, but usable. Even the photo drier was still working. Dad told me to buy the film in bulk and roll my own film to save money. That worked great, but many times I never knew how many shots I had on a roll!! I shot the Ask the Artistschool yearbook photos during the day, and developed the film as soon as I got home. Depending on how many photos I had to develop and the yearbook deadlines, I printed photos into the night. One particular night, I had a very big deadline to meet, and printed photographs until 4:00 am. I was beat, but you can do a lot more when you’re 21!! I lay down to take a small rest before having to get ready for school. Bad idea! Around 9:00 am, the school secretary called to find out why I wasn’t in the classroom!! That brought me immediately wide-awake!! From then on, I set my alarm before taking a rest after a long night of printing!! The yearbook was a real success. I was even asked by the yearbook company to be a guest speaker at a statewide yearbook conference at the University of Missouri in Columbia, Missouri on yearbook layout. Not bad for a small town art teacher with a closet for a dark room!! I changed schools after that year, and moved to Kansas City. I had been accepted to team teach junior high art with the Turner Unified Schools in Kansas City, Kansas. I also accepted the yearbook position. I had fallen love with Steve Kleppe, which made me very happy to be living in the same area with him. Steve worked all day, but I was on summer teacher vacation, and was bored. I tried getting a sales job at an art supply store, but the owner turned me down, saying I would never stay there. I decided to try my hand at advertising art cold turkey with only a few college design classes and a good photography background. Kansas City was a hot bed of artists, cranking out black and white line art everyday for the newspaper and magazines. It is the home of Hallmark Cards, so Kansas City was the Mecca draw for artists. Even though commercial art job calls were in the Kansas City Star everyday, getting a job was another problem. I decided to makeup a fake portfolio of advertising art similar to the ones I saw in the newspapers. After several interviews, I got a job with a Kansas City advertising agency, claiming I just graduated from college. I knew nothing about print or what to do. The advertising team helped me through the process, along with catalogue production, and writing copy. I even shot video for a car commercial! Yikes! I learned everything ‘on the job!’ I met many wonderful professionals that taught me the trade. I loved commercial art and was good at it. It was another learning situation, but I was only there two months, as I had to report to my school for teacher orientation. The truth came out, and I felt like a rat. That advertising company soon closed. Turner Unified Schools had their district office joined with the junior high where I was teaching. The team teaching was wonderful, but the student population was problematic. I had students put sugar into my gas tank and flatten all four tires on my car. Being the yearbook sponsor was nothing. The yearbook company directions were pretty cut and dried with very little creativity. I really didn’t have to do much, because the hard work was done by the yearbook company. During this time, I got married to a wonderful man who appreciated my artistic talents. I left public school teaching for good after that year, being discouraged by the uncomfortable environment of the school situations and its administrative handlings. Although I had left public schools teaching, I still had received enough commercial art experience to get a real advertising job with the Menorah Medical Center in Kansas City Missouri. Since the Medical Center was a teaching hospital, the art department was vital to their organization. We handled many types of promotional pieces from the ground up. They even had their own printing department. On staff was their medical photographer who took me under his wing. I learned so much from being in his studio and listening to what he had to say. I enjoyed my time with the medical center, but I was expecting our first child and left the hospital. The years afterwards were occupied as being a mother and homemaker for my husband, son, and daughter. I continued with my watercolor profession, and left photography. I had no camera or the money to buy one. During my free time I made art for sale at weekend art shows throughout Kansas City. Many times, the money I made helped us to buy groceries for the next week. I stayed active with the greater Kansas City Art Organization and met many wonderful artists. During this time, Steve changed jobs several times, and ended taking a job with a local hamburger chain, Smaks Drive In. The chain had decided to open a new store on the boarder in Brownsville, Texas in a brand new, state-of-the -art shopping mall. Steve had met the operations officer of Smaks through his National Guard group in Kansas City, Missouri. Steve was the Mess Sergeant there and loved to cook. The Smaks officer loved Steve’s work ethic and cooking ability. He offered Steve the job, and soon we moved to Brownsville, Texas. Those days were difficult and long. We were far away from any friends and family. Steve worked all day and night, with a nap in between. I took various art classes at a junior college, and sewed the children’s clothes in the evening to take up time. The main meat supplier for Smaks needed an advertising director for his company. He asked me to join his company to make newspaper and commercial ad pieces. He bought me a drawing board, light, rulers, and other equipment, so that I could produce the finished artwork at home. The meat company owner wanted me to produce a full color meat brochure for his company. With my commercial art and photography background, I undertook the project with great joy. There was a commercial photographer in Harlingen, Texas that I engaged. He had a huge studio with a large format, sheet film camera. I would gather the fresh meat specimens from the plant each day, and arrange them for color photographing. After we finished with the meat, I returned everything to the plant. I wish I could have had some of those prime steaks! I wrote all the copy, and made all the original design and layouts myself. I later produced a full color brochure for the National Association of Meat Purveyors out of Chicago, Illinois. The copy text was given to me by a member of the group and single-spaced. The text needed a lot of editing, so I did that too. I was given little guidance, but put together a wonderful brochure. At the time, all the text type was handset, and all color photos were four-color separations. What a great experience it was for me. They loved it! I learned so much about the printing business. I continued in this capacity for several years. The meat supplier had, also, been selling meat to a Sonic franchisee in Brownsville and the Rio Grande Valley. He was told that Sonic was opening the state of Arizona for development. 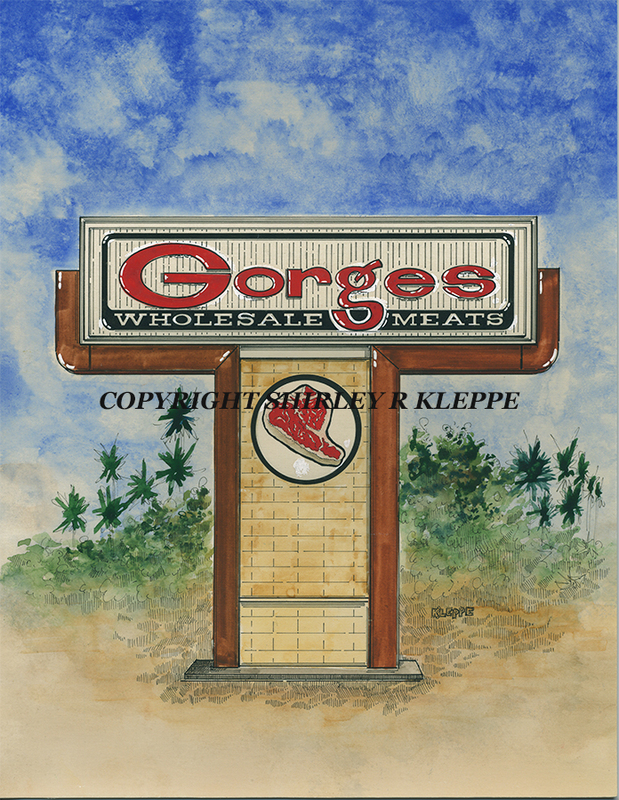 The meat company owner wanted in on the opportunity of franchises, and asked Steve to be his operations man to head up building new Sonic Drive-Ins in Arizona. Being a manager at a small hamburger store in Brownsville was not what we had envisioned in that poor town. We jumped at the opportunity to leave the Valley for Arizona. Steve worked very hard learning the business, but no one in Arizona had ever heard of Sonic. Those days were slow and bleak. Our hamburger meat supplier owner decided he no longer wanted to be part of Sonic, and gave everything back to Sonic. We thought we were done in. The powers that be at Sonic thought Steve was a good man, and hired him to supervise the remaining company stores in Arizona. Sonic eventually asked Steve to be a corporate employee at the home office in Oklahoma City, Oklahoma. Steve had been doing recruiting and training for Sonic throughout the U.S., and Sonic wanted him to be doing hands-on training in house at the corporate office. We were in Oklahoma three years with Steve doing many different jobs, including being President of Sonic Restaurants Corporate Stores. Eventually things changed, and Sonic wanted to sell the company stores in Arizona. We were given that opportunity, and moved back to Phoenix, Arizona. The rest is history, as we were with Sonic for 40 years! Being a “newbie” on travel photography and never having this experience before, I needed to get prepared. Although I had an entry level Pentax camera, I wanted a really great professional camera. My first idea was to visit the largest photography store in Phoenix. The two best 35mm camera manufactures at the time were Canon and Nikon. A store employee brought out the top models of each maker and set them on the front counter. He showed me each model and explained how they worked. 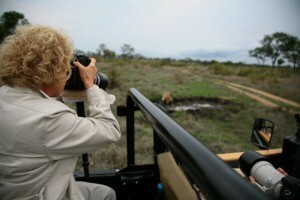 He then put on a 70-200mm f 2.8 image stabilized telephoto lense on the Canon camera for full use effect. This special lense has a gyro in it to make the photo perfectly clear from vibration. I felt it was much easier for me to understand the functions and use of the Canon camera over the Nikon. It was going to be a large purchase, so I gathered my in formation and took it home to present to Steve. Gasp! Later that evening, I made my presentation. I won my case and went back the next day to make the purchase. Oh, happy days! It happened! Oh, happy days! These pre-digital photography days were brutal when it came to traveling. Film was always in danger of being ruined by the scanning machines at the airports. I had to dig out all my film cans and give them to the airport official to hand inspect them. I had ordered many speeds of Fuji Film in print and slide form, with various fame counts. I transported them in an insulated lunch bag with a frozen ice pouch to keep the film cold. Heat destroys the integrity of the film. During this time in my professional art career, I was already using photos for subject matter in painting. With my commercial art experience, I knew how to use slides and a projector to display the image onto a piece of prepared watercolor paper. Using a mechanical pencil, I would sketch the image accurately without a lot guessing. Photography was still the best way to preserve a view for later reference without a lot of undo sketchbook time. Throughout the entire cruise I had my new camera and lense in hand. We stopped at Civitavecchia, Italy port to get a car into Rome. The driver did the trip at 90 miles an hour! Our driver was our guide. We saw everything, and just walked into the museums with no lines. What did we know? It was great fun, and returned to the ship. 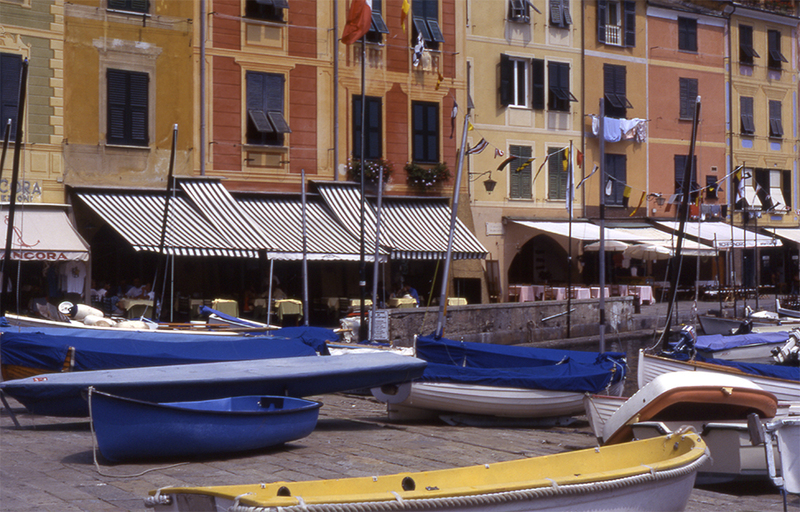 Coming to the end of the cruise, we sailed up the coast of Italy stopping daily at small ports. We stopped at the port to go into Florence. Taking a bus inland, we were let off to walk around. These days were glorious, because there was very little security to endure. All anyone worried about was being pick-pocketed. 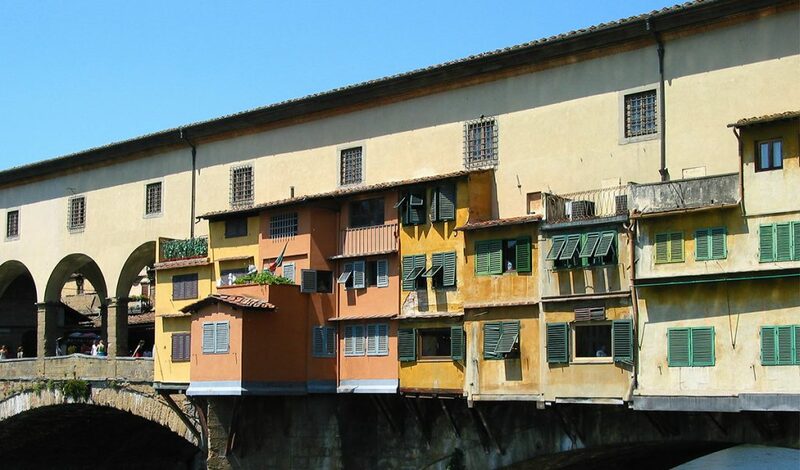 Loving my art history, I was really looking forward to Florence. I loved just being able to freely walk into all the museums to touch and feel all I had seen and learned only from books and films. I stood inches from great paintings in the Uffizi Gallery in awe. The huge crowds were not there, and the people were friendlier. The ship sailed on to Portofino, Italy. The bay is too small to dock there, so we tendered into the port is a smaller lifeboat. The weather was perfect and the colors were brilliant. My head started swimming with all the sights, but I concentrated on looking for painting compositions to photograph. 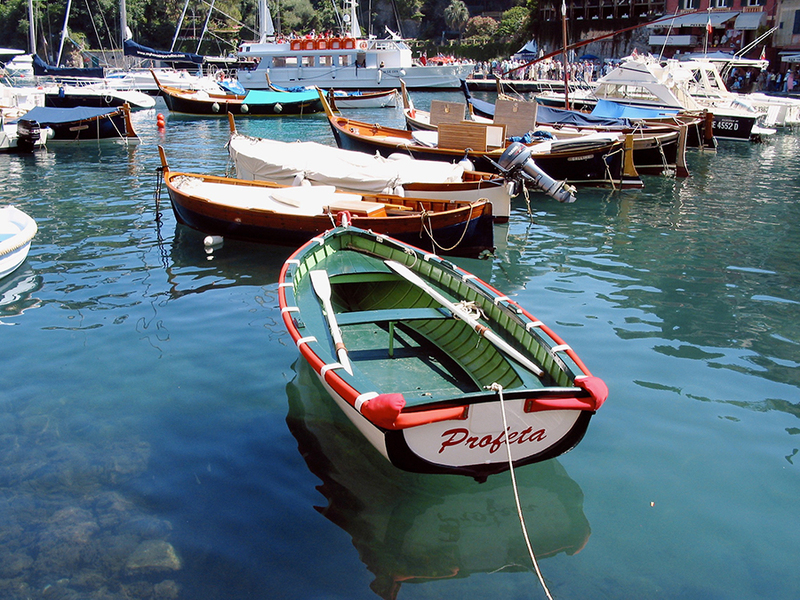 Portofino is a walking town with automobiles and buses only allowed into the very upper part of the village. 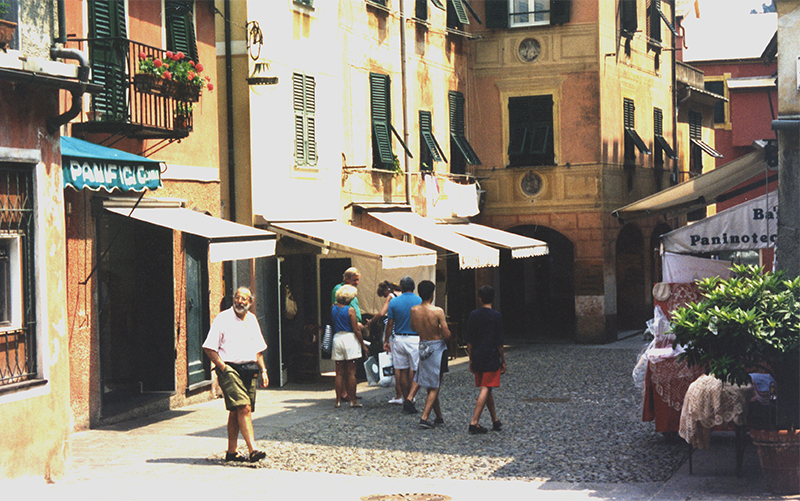 There are many small boutique shops, restaurants, and outdoor bars. The local artists were setup for sales along the port harbor. It was very serene. We opted to search the backstreet area to get an overall picture of this ancient town. From the port, the walkway goes up the hill to a hotel. 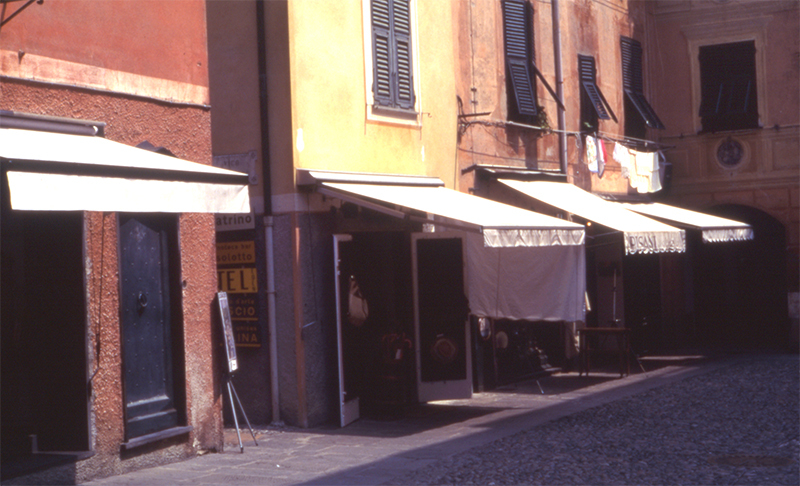 The sun was at its highest with shop awnings in glowing whites, and shadows in subdued darkness. I handheld several photos as best I could. I had to find a better way to photograph on the spot. I knew I would someday return to these photos for a future painting. The diagonal composition was extremely complicated and architectural. Could I do it? 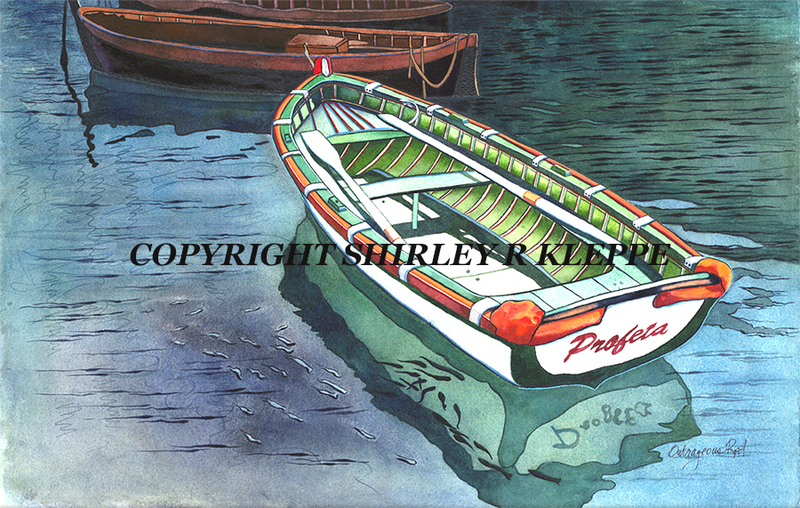 The cruise continued to Barcelona, Spain, but I never saw another composition like the one I saw in Portofino. Years passed, and I was searching my huge photo library for inspiration for a new watercolor. I had already earmarked the slides for future reference by putting them into a special file. I had taken several shots of the backstreet of Portofino, but should have taken more to show the light reflections and details. As I was reviewing the photos, I clearly saw the difference in the radically poor photo clarity of my decades old shots as compared to my photos today. I was hand holding the camera the entire time and used film. My photo work took an enormous leap forward with the use of my invention, Lense On. Although digital cameras were not in use yet, my film shots with the Lense On stabilizing system had hugely improved my photography. I could hold the camera on the Lense On pad and easily move from landscape or portrait format while being totally stabilized.The true secret to the Lense On bag pad system is the zippered enclosed inner bag. This inner bag is filled with non-biodegradable clean crumb rubber pellets combined with small non-reactive plastic microbeads. 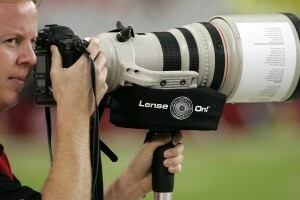 This allows the photographer to shape the bag into any form to fit the position of their camera and lens. Anyone can hold their camera steady on Lense On, so that every shot was squared up. No more leaning buildings! Lense On can be used on any screw mount device, because the bottom of the platform base has two sizes of universal mounts. And it does not stop there! Lense On also has four soft rubber feet on the bottom, which allows it to be placed on any surface without scratching or shifting. I wish I had Lense On for all those years of photography, just to have crystal-clear shots without being screwed down to a clumsy tripod. Lense On is clearly a necessity when taking photography shots that are truly meaningful. Who wants a whole library of out of focus and unusable photos! As a photographer, your intent is to capture spectacular photos. You can do that and more with the perfect camera accessory in Lense On!®. Lense On!® allows anyone from a beginner to a professional photographer to capture remarkably clear photos. 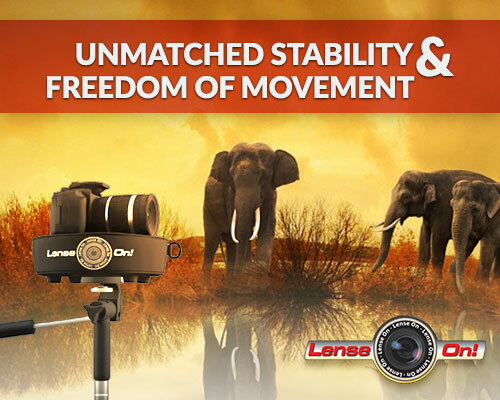 Add Lense On!® to your tripod or monopod and then just simply rest your camera Lense On. Yes, it is that easy to use. For this painting, using the old-fashioned slide projection system was no longer viable. I graduated to a Canon digital projector, and what a lifesaver. I had already prepared the scan of the photo and projected the image on to a full sheet of stretched and mounted 22” by 30” cold pressed Arches watercolor paper with a mechanical pencil. A real 100% cotton rag surface is still the best surface to work on for watercolor. Although the image I was using had been sharpened, I still had to interpret some areas of vagueness with a t-square and triangle. I had combined several photos to determine the composition, but it was so very difficult with the vanishing points being way off the paper. After getting the drawing completed, I stopped. I had never tried to do such a difficult painting before. I got the drawing done, but painting it was beyond me at this point. Not to be out done by my lack of experience, I decided to do a smaller study, 11” by 15”. It was also on the same Arches cold-pressed paper prepared the same way by mounting it on a piece masonite. It is always best for me to do smaller paintings first, so I can recognize the problems before they become huge and non-repairable. I finished the painting, and it was accepted into the Kansas Watercolor Society show receiving a purchase award. But as I expected, there was a huge unrecognized problem. The original photo had a vertical drape coming off the awning in the middle of the composition. It hid the entryway and made a big hole in the composition of the painting. So why did I want to finish the painting that had been haunting my studio for so many years? 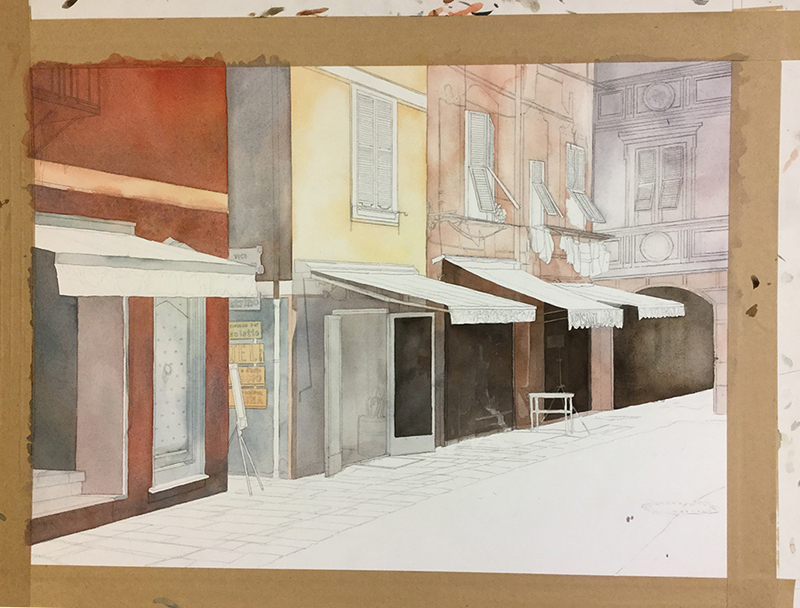 I want to be accepted into the American Watercolor Society in New York City, New York! Any watercolorist around the world who has any merit wants to belong to this hallmark organization of excellence. I have entered their show many times and failed to be accepted. I feel if I could do this painting, it would define my own new personal level of excellence, and maybe be accepted into the American Watercolor Society. I did finish the painting, and learned a lot in the process. 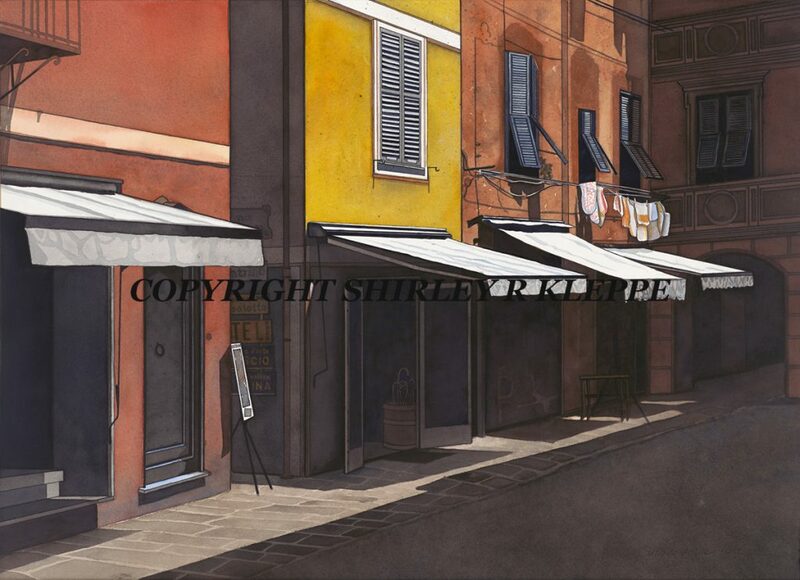 I corrected the awnings, re-worked on the composition, and concentrated on the light and dark values. With so much line work, I did finally give in to use a Sharpie pen with atria the lines of the architectural look. Interview P.S. 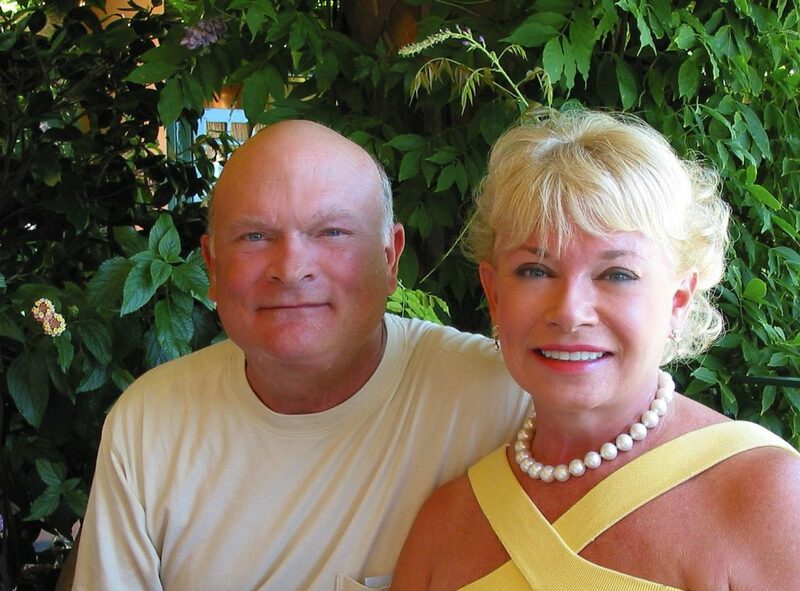 ON NOVEMBER 22, 2018, MY HUSBAND, STEVE, AND I WILL BE CELEBRATING OUR 50TH WEDDING ANNIVERSARY. WE ARE SO FORTUNATE TO HAVE SHARE SUCH A GREAT LIFE TOGETHER.